There has been growing speculations and rumors regarding the upcoming Oppo smartphone but somehow, the company has managed to keep things discrete till now. This device is scheduled to launch on October 10 and apart from the recent TENAA listing, we don’t really know much about this smartphone. 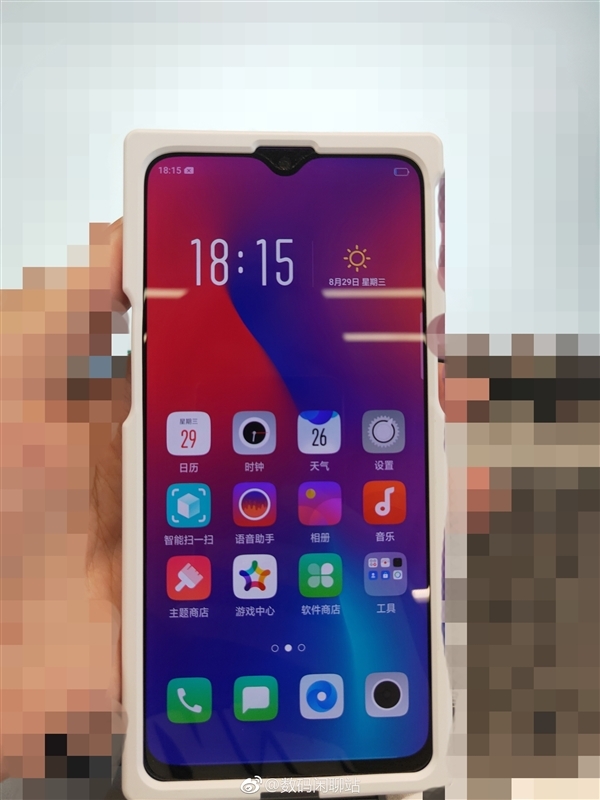 Today, a real image of the Oppo K1 appeared online and though it was in an industrial protective case to avoid spy photos, we were able to see that this smartphone comes with a waterdrop display notch and the screen is quite huge with the recent Color OS. The nomenclature of this smartphone is still up for debate, some believe that its been rebranded Realme 2 Pro. Taking another look at the TENAA listing, the oppo smartphone has the model number PBCM30 but smartphone enthusiasts are highly optimistic that this is the Oppo K1. One of the major highlights of this smartphone is that it comes with an on-screen fingerprint recognition sensor. This is not actually a surprise because oppo was the first company to use this technology so by now, it should be able to use it on all its flagship and even some mid-range devices. The OPPO PBCM30 uses a 6.4-inch 2340×1080 AMOLED display with an aspect ratio of 19.5:9. The screen size and resolution are the same as those of OPPO R17. It is powered by a Qualcomm Snapdragon 660 SoC (backed by Adreno 512 GPU) clocking 1.95GHz coupled with 4GB+64GB and 6GB+128GB configurations. In the camera department, we have a 25MP selfie shooter which continues Oppo’s love for huge front cameras and a 16MP+2MP dual rear cameras. The lights of this smartphone will be kept on by a 3500 mAh battery. According to several reports, this OPPO series will be cost-effective. Xiaomi Mi MIX 3 Launch Date to be Revealed Tomorrow?